Anyways, I brought these to one of my friend's birthday BBQs (I brought some carbomb cupcakes last year, so everyone was anxiously awaiting my arrival to see what I would bring this year). I think that everyone enjoyed them - most of the plates had at least 1-2 cupcake wrappers on them by the end of the day, and I brought home an empty dish. Preheat oven to 350° F. (For a dark pan, decrease to 325-330) Line two dozen cupcake tins with paper liners. In a large bowl, blend all ingredients. Blend on low for about 30 seconds and then increase speed to medium and blend for two additional minutes. Batter will be slightly lumpy. Spoon the batter into cupcake liners (about 2/3-3/4 full). Bake for 20-25 min, or until toothpick inserted in center comes out clean. Remove from pan to cool. Place butter in a large bowl and beat with electric mixer until butter is fluffy. Add powdered sugar, salt, lime juice, and lime zest. Mix until thick and creamy. Add more powdered sugar (or lime juice) until the frosting is of a good spreading (or piping) consistency. 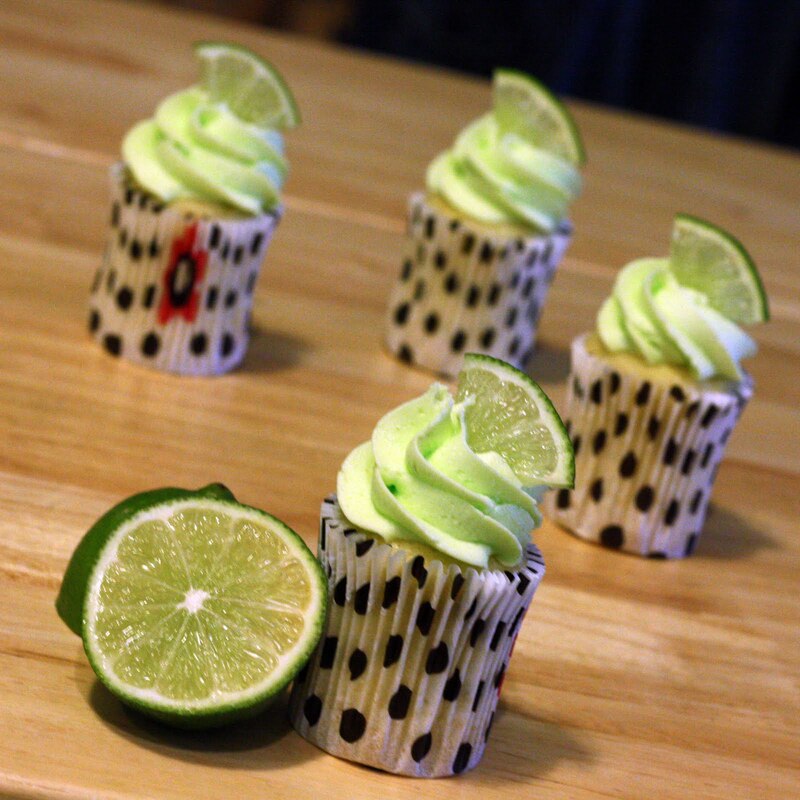 Mix in a tiny amount of green food coloring or gel paste if you’d like the frosting to have a green tint. Frost as desired. I used my cool new cupcake pan from Ikea (aren't the cupcakes cute!). It's not as small as a mini cupcake pan, but smaller than a regular pan. (The cupcakes are as tall as regular cupcakes, but the base is the size of mini cupcakes.) If you happen to have this pan, the cupcakes took 13-15 minutes to bake. I REALLY wanted these to taste like Margaritas, not just lime. 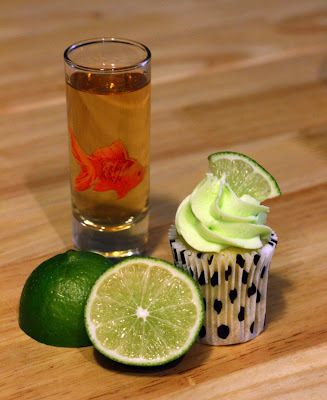 While I didn't want them to taste too much like alcohol, I did mix about a shot of tequila with about 1/2 shot of Rose's Lime Syrup, and brushed that on top of the cupcakes prior to frosting. And while we're speaking of the alcohol - the cake batter will taste & smell strongly of tequila - don't worry, after baking, the flavor is much more subdued.